Texas & Toyota: I’m Back! 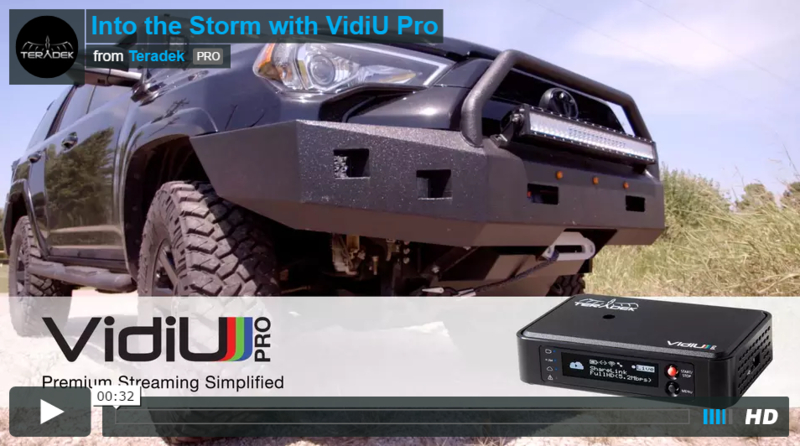 Teradek Vidiu Pro Review – A Storm Chaser’s Dream! In early 2015 I purchased a Teradek Vidiu. For those unfamiliar with Teradek, in a simple sense, the device allows you to to take a video/audio feed via HDMI, and broadcast it wirelessly to a number of possible outlets. For me, I always had taken my AV out from camera, converted it to USB, put it to my laptop, then used a streaming program like Adobe FME, or Open Broadcaster, to send that to my streaming platform. That was honestly a pain, it was clunky, required way too much attention being paid to the computer, etc. Teradek eliminated the work of the PC. Teradek Vidiu Pro can take a wifi signal, ethernet port, or USB modem (or a combination of them) and broadcast right to your platform. If you’re using a streaming company like ChaserTV, it works, just input your rtmp URL and any codes and you’re done. If you’re using YouTube, that’s super easy too. You can create a live event and stream right to it, and start/stop. All of the settings can be easily configured via your smartphone, etc, so it’s really easy! One of the favorite things with the new Vidiu Pro vs the old Vidiu (I was fortunate enough to beta test this device for Teradek) is the ShareLink feature. ShareLink lets me use multiple internet sources and “bond” them together to make sure I have the best possible resources for sending my signal out. Maybe I have a Verizon USB modem and an ATT phone.. I can wifi tether the phone and USB in the modem, and use both connections. I can also monitor the connections through the Dashboard feature, and see which device is being used the most, is the most reliable, etc! Simply put, the Teradek Vidiu Pro, which introduced ShareLink, is awesome for my application as a storm chaser, and many other uses. I can mount this device to my hot shoe on the camera, and get out and film a tornado and stream it live. No longer am I confined to windshield suction mounts and dash cams, now I can stream anything live from anywhere! Here’s an awesome promo commercial I did with Teradek. Check it out! ← Deadly Hurricane Patricia — Coverage from Ground Zero! I am an entrepreneur, meteorologist and storm chaser. I travel and take captivating photos and videos across the world. If I'm not chasing, I'm at the gym. All opinions are my own and do not represent my employers or investments. Copyright © 2019 BTSull.net. All rights reserved.